This collegiate-style design is perfect for academic birders! 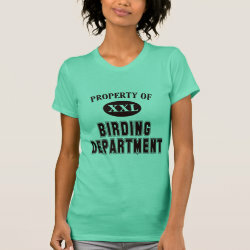 Text is arranged as on an athletic department shirt, but here the item belongs to the "Property of Birding Department". Perfect for any birder - for we are all life-long learners, aren't we! ?